Hebrew Scriptures Greeks Canaanites Israelites Romans Christians Muslims Crusaders. You will meet them all in this lively guide book, as you tour from event to event in the history of this small piece of land, wedged between Egypt and the Fertile Crescent. 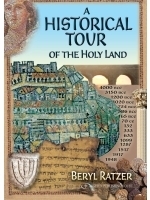 Guide and teacher Beryl Ratzer covers this history-worn land chronologically from the Book of Genesis to the peace agreement with Jordan. A practical blend of history, religion and guiding tips, this is a book to refer to again and again. The contents have been checked for accuracy and are not political. In fact the book is offered to participants in guides courses. Written for the amateur historian, the reader is swept from pre-history to the present, learning the history of Israel along the way. A must for those who do not always have the facts at their fingertips and not only for those visiting Israel. Although full of facts the book it is easy to read and to use as a chronological key to all the historical periods.